A relaxing evening on a Big Island cocktail cruise is the perfect way to end any day. If you are looking for sightseeing, you will love the opportunity to see spinner dolphins and humpback whales on your Big Island cocktail cruise. If you are seeking entertainment, these cruises have great music from local bands. And you’ll have access to appetizers, and of course, cocktails, during your sunset cruise of the Big Island. 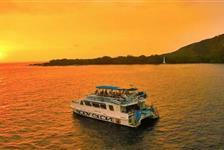 Book your Kona cocktail cruise of the Big Island today.